The PaintBuddy from Rubbermaid is a small canister that can be filled with paint. 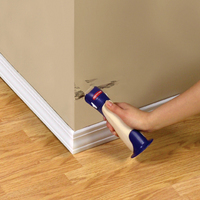 When touch up painting is needed a value can be opened and paint applied to a small roller and thus to the desired surface. It appears quick and easy. It's also smart marketing. Much like the Dutch Boy painting products I blogged before, the Rubbermaid PaintBuddy is smart marketing. Like many of Rubbermaid products the PaintBuddy uses design to deliver great marketable functionality. Rubbermaid isn't marketing a new way to paint. The PaintBuddy represents a neat and well painted home. That has a far greater appeal than just a new painting gadget. This makes touch up painting as easy as cleaning. P.S. Mom, don't show this to Dad because, ahhh, Father's day and all.